Christoph von Breitenbuch is the managing director of the ABG Leine-Solling. The ABG Leine-Solling manages four individual agricultural properties in the South-West of Lower Saxony. Mr. von Breitenbuch is responsible for the crop cultivation and the profitability of the agricultural business. The spatial distribution as well as the distinct phenological development at the different farm sites is a reason for Mr. von Breitenbuch’s demand for large-scale spatial information on biomass derived from satellite data. TF Base Map, TF Biomass Map and TF Yield Forecast were delivered to the ABG Leine-Solling. „In some locations on our farms, permanent water logging causes problems. After receiving the TF Base Map in summer 2012, my personal impression of the drainage problem was confirmed. The problems are caused by penetrating soil water of a nearby ridge. 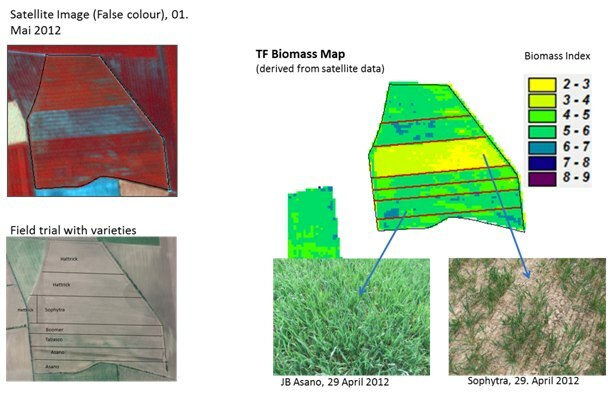 The TF Base Map shows lower persistent relative biomass at the affected sites compared to other neighbouring fields with comparable soil quality (see following figure ). Confirmed by this objective and reliable information source, I was able to realize the installation of a new drainage system with the support of the other partners. As for my crop management, I also look ahead with TalkingFields. Up-to-date TF Biomass Maps from spring 2012 showed me clearly where winter damages have happened. Thus, I can monitor crop growth and, if necessary, react with measures. For example in 2012, I discovered some smaller winter damages in remote field parts only after looking at the TF Biomass Map. Reacting instantly and re-sowing these fields, the yield loss could be reduced. Demo User Rüdiger Klamroth, site specific strategies are realized in large parts of the farm management. “The soils on our farms are very heterogeneous. The soil differences are mirrored by the biomass patterns in the TF Base Map. Subterranean lime ridges running through our fields, clearly coincidence spatially with areas of low persistent relative fertility in the TF Base Map. In 2012, I arranged a field trial with different varieties of winter wheat especially for TalkingFields. Some varieties were developed well after the winter season. Others suffered from winter damages and never caught up. The up-to-date TF Biomass Maps confirmed this without a doubt. The TF Biomass Map derived from satellite data of the 1st of May clearly shows that the variety JB Asano had a good growth status after winter, while Sophytra was weakened by winter damages. Field stripes with trials on ploughless tillage show lower biomass values in the TF Biomass Map than areas with usual tillage (see following figure). For the future I know that ploughless tillage is not always successful. „Everything looks different from above? No, the TF Base Map has confirmed my results from other techniques like soil scanning or the farm soil map. At the same time, the data is available fast and for my whole farm, and the effort I as the farm manager had to put in was low. Especially in regions, for which there is only little information about the site characteristics available, the TF Base Map is a sound and reasonably priced information source. Now I want to take the cooperation a step further and use TalkingFields also for my daily crop management. product they received was in 2010 the TF Base Map. Efficient production on large areas using state-of-the-art agricultural machinery requires reliable information to achieve reproducible decision-making. Knowledge of small-scale differences is a must, especially for large, heterogeneous fields. Satellite data provide an overview, show patterns and allow an estimation of heterogeneity in the field. We show you how to use this information for your decision-making processes. TalkingFields products determine the characteristic performance of your sites and quantify current biomass and yield.